How to scale images using percentages? Does anyone know how to scale images using percentages? How to move a picture inside a frame? You can type a percentage in the W or H controls in the Transform panel. Linking the two beforehand will mean that you only need to type the value once. The new absolute values will be treated as 100% for the next transform, so there’s no easy way to get back from (say) 43% to the original 100%. "Preserving" the percentages doesn't make any sense logistically in this context. If the width were actually set to 43% (to borrow the above example), what would it be 43% of? 43% of the total width or height of the size of the image. If an image has a width of 100cm, and you would like it be placed in Publisher as an image using a width of 43cm, the image should be placed as 43%. Knowing the images is placed in 43%, will allow us to quickly identify the potential of an image, allowing us to enlarge it again, if required. "quickly identify the potential of an image, allowing you to enlarge it again, if required"
Indeed, using the Resource manager you can also check the resolution of an image. But it's only displayed in 1 dimension. If an image has been resized disproportionately, there is no way to check it. What is the default workflow to check for disproportionately placed images and to restore them to proportions? What is the default workflow to check for disproportionately placed images and to restore them to proportions? Wouldn't it be easier to not distort them in the first place? Or to notice distortion as you cause it, and Undo? If you know the original image size and the placed image size ( as shown in the resource manager ) you can work out if the image has been "distorted". Might be basic math, but it is a whole lot nicer/faster to simply know that information. I don't work in teams anymore. But I do receive files from others where an image might have been manipulated to fit a given space. Happens all too frequently. using the Resource manager you can also check the resolution of an image. But it's only displayed in 1 dimension. I'm not sure what you mean by that. Here's a screenshot from the Resource Manager, and I see both dimensions. Of course, you have to examine each image individually, which for a large document with many images could be time consuming. And it's annoying that the units aren't the same (necessarily) between original and placed sizes. The "Placed DPI" column uses online one dimension. The information panel located on the right doesn't display actual size in DPI. Where is the "image info" panel located? As a designer I can look at any image when placed in my designs and know if it looks OK or not. I do not need the program to tell me it's been "distorted". In fact, on many occasions, I may choose to "distort" an image deliberately if I feel it would look better than the original. For me, designing is about what the final output looks like. It is not about what the program tells me has been done to the images. Sorry, that panel is one I have displayed in QuarkXPress. It's an XTension I added to QXP. Well, good for you, Carl. I do, however, want to know all that information at a glance--as well as the effective PPI, be able to swap out images/vector work etc. from that little palette. Check the top left corner of the interface with an image selected. It should display the placed dpi right after the resolution. If the image was distorted it should display a dpi value for each dimension instead (width and height). Yes, but it can lie to you--at least using Windows. Place an image. Note the DPI as a single value. Stretch it vertically. Note the horizontal DPI remains fixed. Now undo. Now stretch it horizontally. Note the change to the vertical DPI. Here it is a consistent 1 DPI off. But the main issue for myself is getting it back to 100% without fiddling around. Again, I agree with Mike. Change the size to another value using percentages should be made more easy. If that's the case, that's a bug on Windows. It works fine on Mac. Currently there's no way to reset the image dimensions. I agree it's useful but a button is enough to reset them. Any particular use case for percentages? ... Any particular use case for percentages? You mean beyond the information at a glance so the user can take action or not? 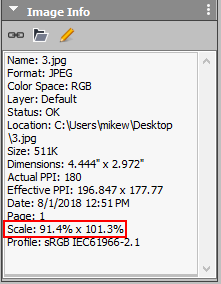 Or easily reset the dimensions to 100% H/W or whatever the scale is proper for the image frame (in the case the image is larger than the image frame and one only wants the dims an even percentage? Nope. Not that I can think of right off. If the question is knowing if the image keeps the original ratio or was distorted the dpi on the left corner should give you a hint. A button to reset it to the original dimensions should be enough. If you really also need to resize it an even percentage (or whatever) you can do so through the Transform panel.